Has your PC lost its pep? Do network file transfers merely creep along? How about your printer, or your camera? Do Web pages take forever to load on your smartphone? 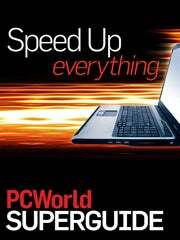 PCWorld's latest superguide, "Speed Up Everything," is full of helpful fixes to get you back into the fast lane. First, PCWorld editors explain how you can supercharge your PC's hardware. No amount of tweaking inside Windows can give you the same kind of speed boost that a few judicious hardware upgrades can--the most effective way to soup up any computer is to start by updating the components inside. We describe how to upgrade the two most vital components: the RAM and the graphics card. Next, you can streamline Windows. Whether you run Windows XP, Vista, or 7, you have a few really good ways to cut out the fluff and make your OS run more smoothly, quickly, and efficiently. By turning off unnecessary features and disabling unwanted startup programs, you can see instant improvement. 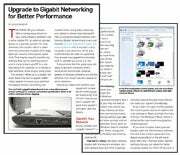 Network slowdowns are another troublesome bump in the road to high-speed computing. And they can be tricky to troubleshoot. Much depends on what you're doing across your network--copying files to another system, for example, might slow to a crawl if you're writing to a NAS device attached to a poky PC in the next room. 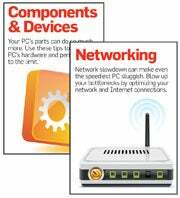 But a few general tweaks and tricks can still boost your network performance in Windows. We'll show you what they are and how to perform them. And don't overlook your hard drive. Though we live in an age of cheap, readily available storage, the sheer number of choices available can make selecting the right drive a tricky proposition. Choosing a fast drive--whether internal or external--can have a massive impact on your PC's performance, as well as on that of your network. We'll let you know the things to consider when selecting a new drive. What about your phone? Every day, avid smartphone users push their devices to the limit with downloads, Web browsing, and multitasking in various apps. All of that activity can lead to frustratingly sluggish phone performance. Smartphone slowness is mainly related to two things--limited memory and a drained battery--though other factors are involved, too. With some routine phone maintenance and the help of apps and accessories, you'll have your smartphone running as fast as it did on the day you bought it. In addition to speeding up your system, network, and phone, we'll give you hints about boosting your camera and printer. If you're ready to rev up your PC, don't miss this superguide. The "Speed Up Everything" superguide comes in two convenient formats--just choose the one that works best for you. If you'd like to read it immediately, look no further than the PDF version, available for just $12.95 from our online Web store. Or if you'd like to give the PDF version of this book as a gift, you can have it mailed to you on a CD-ROM for $14.95. Not convinced? If you want to see more before you commit, we created a sample PDF that includes the superguide's complete table of contents and selected pages.